Grab your tickets to R18 v Giants! PORT ADELAIDE will unveil its first debutant of the season when mature-age rookie Jarrod Lienert comes into the side to face Greater Western Sydney at Adelaide Oval on Sunday. 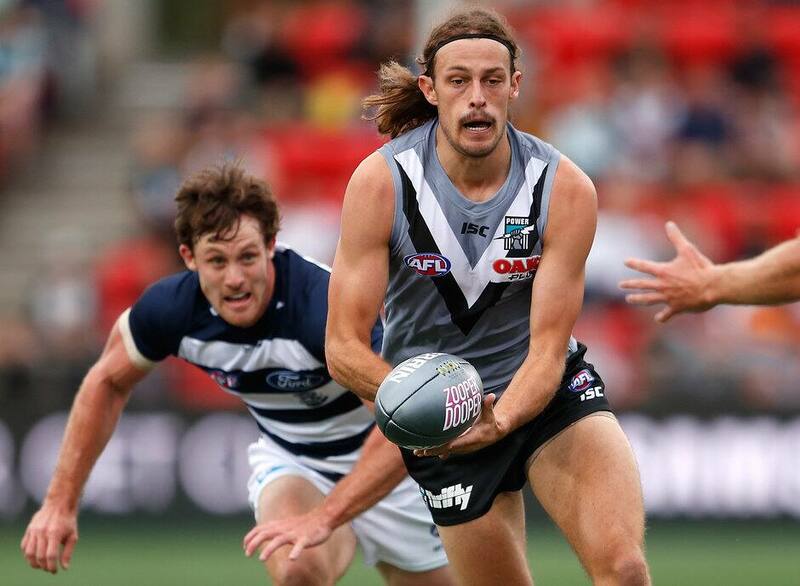 Coach Ken Hinkley confirmed Lienert would be one of two changes with running defender Jasper Pittard recalled in place of Riley Bonner. Hinkley said Lienert deserved his opportunity after impressing in the SANFL this season, either side of knee surgery in May which sidelined him for two months. "He probably would've played well before this (if not for the knee surgery) and he's worked his way back and he's playing some really strong football," Hinkley said at a press conference on Friday. "He's been playing as a key back, he's got a bit of pace, he's got a nice leg, some really positive things. "He's got some AFL stuff that will make us better." With defensive general Tom Jonas sidelined with a knee injury of his own, Lienert has the ability to play a similar role. The 23-year-old is 193cms and 89 kilograms but plays both tall and small. Ruckman Paddy Ryder will miss Sunday’s game because of his hip flexor injury, but in a boost for the Power, Hinkley confirmed forward Robbie Gray was an all but certain starter after overcoming concussion. Gray was knocked out as a result of a sling tackle that saw Fremantle defender Ryan Nyhuis given a three-game suspension for rough conduct. "He's right to go, which is really positive, because we all saw the incident," Hinkley said. "Rob was pretty positive about how he was feeling, and he's now done his concussion testing and passed all of those, and he was running around today. "We've still got to get to Sunday, and we'll make sure he's okay tomorrow. "In any of these circumstances with concussion, you're never quite sure when it may come up again." Ryder’s absence means Justin Westhoff and Charlie Dixon will share ruck duties. But Hinkley said his side had experience earlier in the season of making do without Ryder from when the big man suffered an achilles injury in round one and missed several games. "We know what it means, it means some slight disruptions in a perfect world you wouldn't want to do, but it's round 18 coming up, there's injuries all over the AFL, we're no different, we've got some injuries,” Hinkley said. "Clearly, we'll be a bit smaller because of that but we've got some flexibility in that space with plenty of midfielders that can go forward." Hinkley said getting on top in the midfield would be key to Sunday’s result. He said the Giants had some midfield weapons that would need to be negated, pointing out his side’s disposal efficiency, effort and ability to hit the scoreboard needed to be better than in last week’s loss to Fremantle. “They’re really really strong,” Hinkley said. “We’re playing a side this week that we know if we don’t hit the scoreboard a bit better than we did (last week) we’re going to be up against it because we know they will.